I’ve used my unfair share of painkillers over the years, being a chronic migraine and body pain sufferer. I’ve always considered them to be mostly harmless, moderately effective but too easy to pop. About 3 years ago I discovered that the pain meds I had been prescribed for my migraines for the last 30 years had been clearly shown to actually increase recurrent migraines and since then I’ve gradually reduced my use. I thought that my bad experience was fairly unique and restricted to pain killers containing codeine and the triptans, but it seems that the bad news keeps on coming. 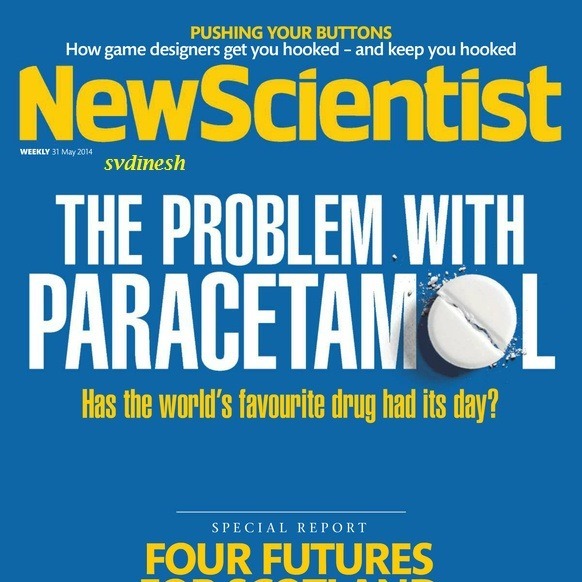 This weeks New Scientist points out that in the US there were 16,500 NSAID related deaths for Arthritis patients alone, even more worrying is data about the ‘mostly harmless’ paracetamol that we pop so frequently in the UK. Recent research suggests that long term paracetamol use may result in as much internal bleeding as NSAIDS, a full unit of blood over a period of three months and two units when combined with ibuprofen. In addition paracetamol accounts for 800,000 emergency room visits arising from overdoses in the US (most of them accidental). If it was effective maybe these risks would be acceptable, but out of seven studies that compared paracetamol to placebo two found it provided no benefit at all and the rest showed it’s effectiveness to be marginal. In fact for paracetamol and aspirin (the two over the counter meds studied) for every 4 people who took them, only one person experienced a 50% reduction in pain, so I assume the other three experienced no benefit better than placebo. if you use them regularly the body develops a dependence on them and when you stop taking them you get a rebound headache, so you pop some more. What happens is that your body gets used to the painkillers. A rebound headache develops if you don’t take a painkiller within a day or so of the last dose. You assume it’s just another tension headache or migraine and take a further dose of painkiller. When the effect of the painkiller wears off, another rebound headache develops and the cycle continues. “If you take painkillers for your headaches more than twice a week for more than three months you’ll be at very high risk of getting rebound headaches,” says Dr Ahmed. Personally I try to keep my usage below 10 days a month and as an alternative I use 4Head, read the articles at source and make up your own mind. If you are anything like me though you will find that the less you use them, the less you will need them. It’s also worth bearing in mind that headaches are often a signal that something is out of balance in your life, maybe you need to eat better, relax more, take more exercise, take a read through my simple guide to health for tips. The photo today is of the cover of the New Scientist magazine, in case you didn’t guess! Back to relaxing beach scenes tomorrow!